The copy of this book that I bought was a coffee-table size paperback published by Tuttle Publishing. My anticipation was that it might be quite light on detail and full of generic pictures. It is actually a meticulously researched work. Dan Free seems to have spent 25 years on that research. The book begins by dividing the story into historical periods. The general history of Japan in the years before 1853 is surveyed in the Prologue, , (p11-19). Chapters cover short periods in what was a rapidly developing political landscape. Japan was a place of intrigue and political machinations as the power of the shogun rulers dissipated and became refocused around the emperor. Foreign powers fought for a prime place of influence over events within Japan. Increasing confidence in indigenous engineering ability among Japanese leaders led to local control beginning to be exercised over construction projects and expensive foreign engineers contracts gradually not being renewed. The first railway built was that between Yokohama and Shimbashi in Tokyo between 1870 and 1872. In 1868 Thomas Blake Glover, a Scottish merchant, had brought the first steam locomotive, “Iron Duke”, to Japan, which he demonstrated on an 8-mile track in the Ōura district of Nagasaki. However, after around 250 years of a culture of ‘distrust of foreigners’, construction of the ‘premier’ railway connecting Japan’s former and new capitals by non-Japanese was considered politically unacceptable to the new Japanese regime, and so the government of Japan decided to build a railway from the major port of Yokohama to Tokyo using British financing and 300 British and European technical advisors: civil engineers, general managers, locomotive builders and drivers. The line between Kobe and Kyoto was the first railway in central Japan. Further railway building took place from 1877 to 1884 – the short (11.25 mile) line to Otsu was designed and built by indigenous staff; the line from Tsuruga to Shiotsu; Nagahama to Shunjo; and East to the Nobi Plain. This is Shinagawa Station in the late nineteenth century did actually look this rural, with the waves of Tokyo Bay reaching to the very edge of the station. In those days, certainly nobody foresaw that the tiny country station would grow into today’s massive complex. It now services over three quarters of a million passengers daily, making it one of the busiest stations in Japan. In spite of its humble location and looks, Shinagawa Station played a title role in the development of Japan’s railway system. The country’s very first daily train services, which started on 12th June 1872, ran between this station and Yokohama. Yokohama’s foreign settlement had turned into a crucial trading port and was located some twenty kilometers southwest of Shinagawa. The 6th chapter of the book concentrates on the period from 1880 to 1895 which was a time for extending and better integrating the network across the country. The 6th chapter forms a significant portion of the book , (p109-180). The text is well illustrated by postcard views of stations, buildings and track-work. The focus is primarily on the ‘Cape Gauge’ mainlines with only short digressions mentioning the smaller gauge lines which later would become important as industrial lines in the valleys in the mountains. The 7th chapter covers a period of 10 years from 1895 to 1905. The early part of this chapter highlights the lead in innovation taken by the San’yo as it gradually became a major trunk line. Innovation was essential as the San’yo was something with well established shipping routes connecting the same cities , (p183-185). This period was a time of ‘railway mania’. For example, in 1896 alone, 555 applications for provisional charters were made. Private railways built around 400 miles of railways per year in 1897 and 1898, , (p181). That this was both a time of expansion and innovation is evidenced by the activities of others as well. The Imperial Japanese Government Railways (IJGR) faced intercity competition from the Kansai Railway between Osaka and Nagoya, , (p185). By the end of the Sino-Japanese War, railways “were ever increasingly becoming an integral part of the lifeblood and social fabric of the nation and as the network expanded, the effects began to be felt throughout the realm,” , (p187). As the century turned the San’yo Railway Company became increasingly self-confident. They were not afraid to bid for foreign tourist trade: “When this as first appeared in 1904, during the Russo-Japanese War, the progressive line had put in place three steamer routes connecting with Shikoku and a ferry route to Kyushu. It could also state that all its express trains (four in number) were electric-lit, steam heated, and furnished with sleeping and dining cars,” , (p197). 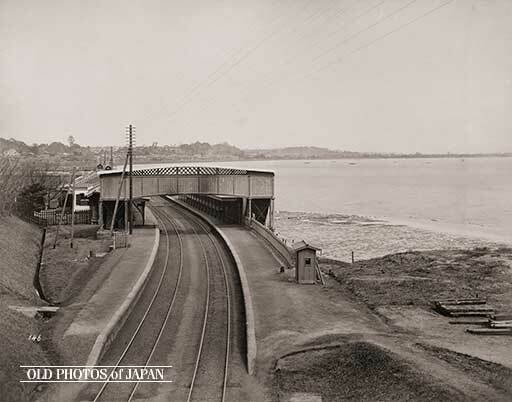 During this period, with venture capital in short supply in Japan, smaller towns and industrial concerns took to developing their own light railways. They were known as ‘gyusha kido’ (ox car tramways) or ‘jinsha kido’. They were light railways where oxen were used for motive power and as a result enabled circumvention of the existing statutory framework surrounding railway construction. There was also one example of a logging railway powered by dogs on the island of Shikoku which became known as a kensha (dog car) tetsudo, , (p202-203). The 8th chapter focusses on the short period surrounding the nationalisation of the railways (1906-1912) and is entitled ‘Nationalization and Self-sufficiency’. “The military vociferously asserted its dissatisfaction with the coordinating abilities of the various private railways in the past war, but conveniently ignored the fact that many of the delays and inconveniences were not attributable to internecine squabbles between various private railways, but were more likely the natural consequence of a railway system that was still overwhelmingly single-tracked and strained to its limits,” , (p226-227). “An ambitious program of double-tracking all primary routes might have been just as effective a solution. The various arguments pro and con were posited, but in the end, after more than a decade of debate, the vote for nationalization carried in the Diet on March 31, 1906,” , (p227). 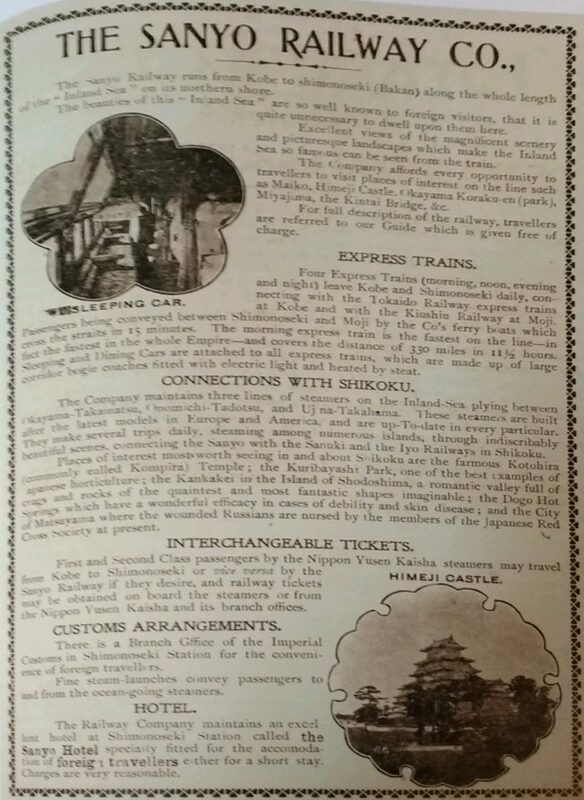 http://www.theshogunshouse.com/2009/02/early-japanese-railways-1853-1914.html?m=1, accessed on 16th March 2019. Peter Semmens; High Speed in Japan: Shinkansen – The World’s Busiest High-speed Railway; Platform 5 Publishing, Sheffield, 1997.
https://en.wikipedia.org/wiki/History_of_rail_transport_in_Japan, accessed on 17th March 2019. Hirota Naotaka; Steam Locomotives of Japan; Kodansha International Ltd., 1972; p22-25,34-38,44-46&52-54 referenced in . https://www.oldphotosjapan.com/photos/834/shinagawa-station, accessed on 19th March 2019. Dan Free; Early Japanese Railways 1853-1914: Engineering Triumphs That Transformed Meiji-era Japan; Tuttle Publishing, Vermont, 2008. This entry was posted in Japanese Railways, Railways Blog on March 19, 2019 by rogerfarnworth.